MedO is a green roof system that utilises established green roofing technologies in a simple and straightforward way. 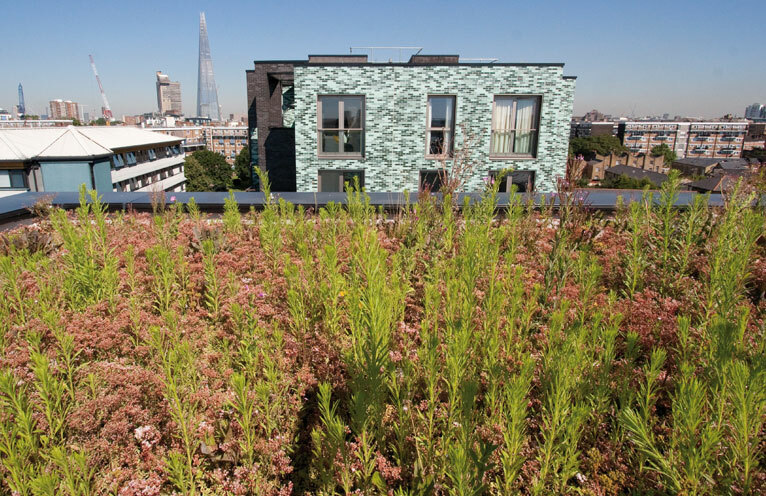 A variety of green roof solutions can be created – from low maintenance sedum matting and wildflower meadows, to landscaped roof gardens with lawns, shrubs and water features. MedO green roofing systems can transform both new and existing roofs into lush, vibrant, biodiverse environments that protect your roof membrane. The decline of many species of wildflower and insects has accelerated with the decrease of natural habitats – the recent reduction in the bee population is said to be one such casualty. 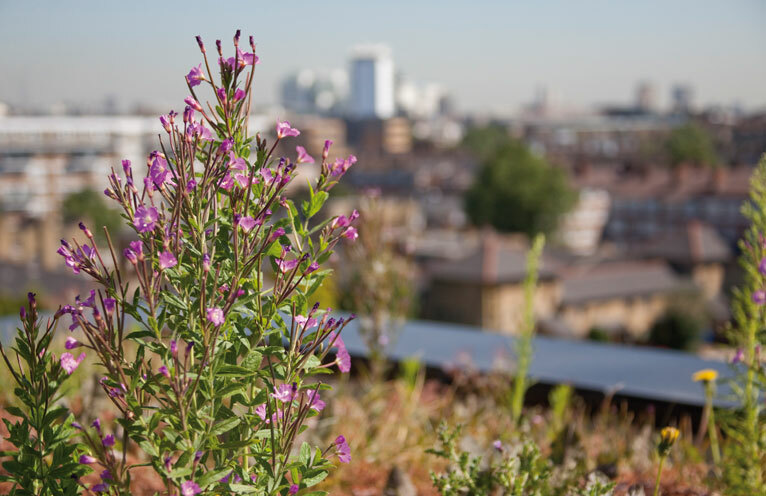 Installing a green roof is an ideal opportunity to create conditions for natural wild flower plants and increase biodiversity, as well as protecting and prolonging the life of your roof membrane. Radmat provide pre-grown sedum matting, wildflower seed mixes and more conventional plug plants varieties. 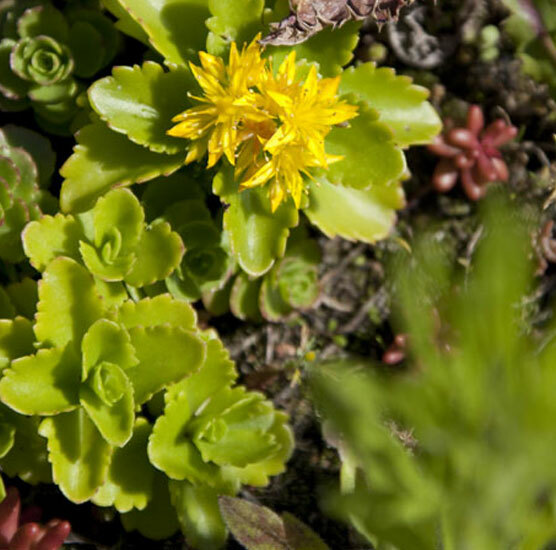 Sedum species are well adapted to their use within extensive green roofs. They are drought tolerant, able to withstand extremes in climate and can grow on relatively shallow substrates. There are many species with a range of form and colour, and generally flower from early summer to autumn. Sedum are able to survive on shallow substrates depths, lower nutrient levels and little or no irrigation requirement (when correctly designed and installed irrigation is generally only required in the initial establishment phase, and then very rarely afterwards). To establish a self-sustaining plant community a uniform substrates depth of between 50mm and 80mm is recommended. Shallower substrates depths can be used but can affect the success of plant species at different time of the year, similarly deeper depths are possible but may help the establishment of invasive species such as grasses. 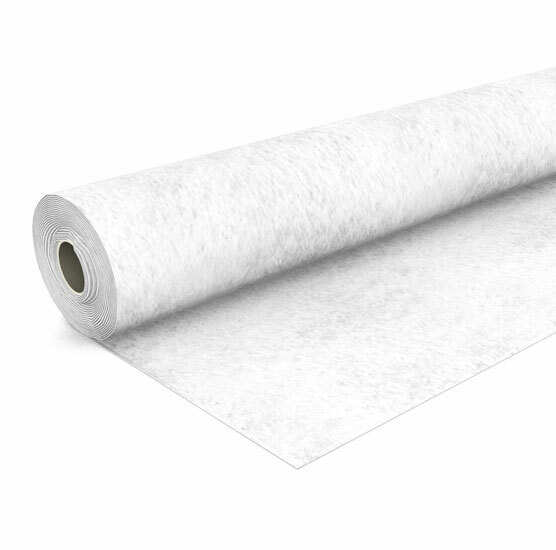 The selected waterproofing system should be compliant with BS EN 13948: 2007 ‘Flexible sheets for waterproofing. 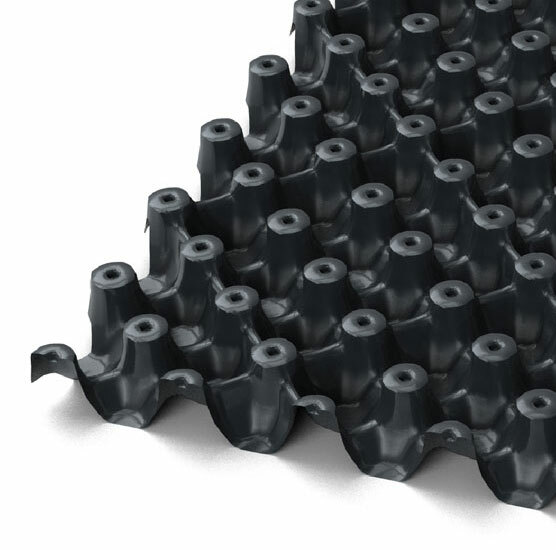 Bitumen, plastic and rubber sheets for roof waterproofing. Determination of resistance to root penetration’ or certified in accordance with the German FLL guidelines. An intermediate green roof type that can include characteristics of both extensive and intensive roofs. Irrigation and maintenance requirements are dependent upon the plant species installed. 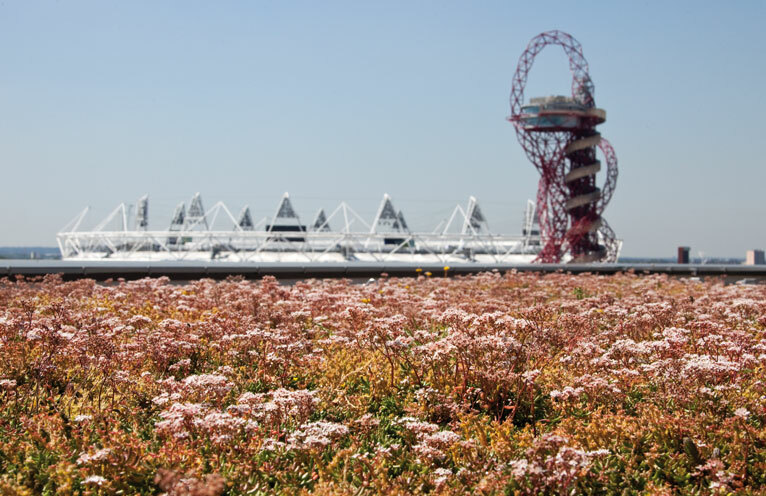 The deeper SUBSTRATE/GROWING MEDIUM enables a wider range of plants can be included compared to extensive sedum green roofs, including wildflowers, shrubs and woody plants. Typically requiring a uniform depth substrates depth of 100mm to 200mm depending on species being planted. 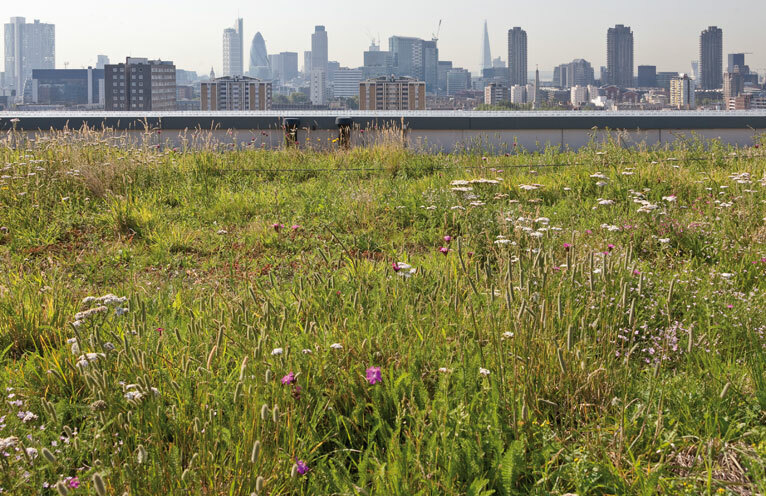 As the name suggests Biodiverse roofs are created primarily for biodiversity purposes and can aim to recreate the habitat that was lost when the building was erected, or even enhance it. This category includes the ‘Brown’ biodiverse roof or ‘Brown Roof’ which is not purposefully planted. The growing medium is selected and installed to allow indigenous plant species to inhabit the roof over time. The ‘management’ of a biodiverse type green roof very much depends upon what the client requires. It can be managed more heavily to produce a controlled ‘wildflower meadow’ type environment. Less management input may lead to the development of vegetation which progresses naturally relating to the prevailing conditions. A ‘Green’ biodiverse roof would generally be broadcast with an appropriate seed mix (often wildflowers and grasses), and/or planted with species of plug plants (often wildflowers, sedums and grasses) to encourage specific plant types that will support certain bird and invertebrate species. Pre-grown mats containing mixes of drought tolerant wildflowers, grasses and herbs can also be installed to provide a more ‘instant’ cover. Substrates depths may vary across the roof deck to promote a diversity of both shallow and deep rooted plants and ones which are more and less drought tolerant. Undulating SUBSTRATE/GROWING MEDIUM depths also create differing habitats for a greater range of invertebrate species. Pebbles, boulders, gravels, sands, branches and logs may also be placed within the system to offer suitable habitats. Intensive green roofs (also termed Roof Gardens) are principally designed to create recreational and amenity spaces for people to enjoy. Intensive green roof systems require a higher level of maintenance, including regular irrigation. Planting is usually similar to traditional gardens including lawns, trees, shrubs and hard landscaped areas. 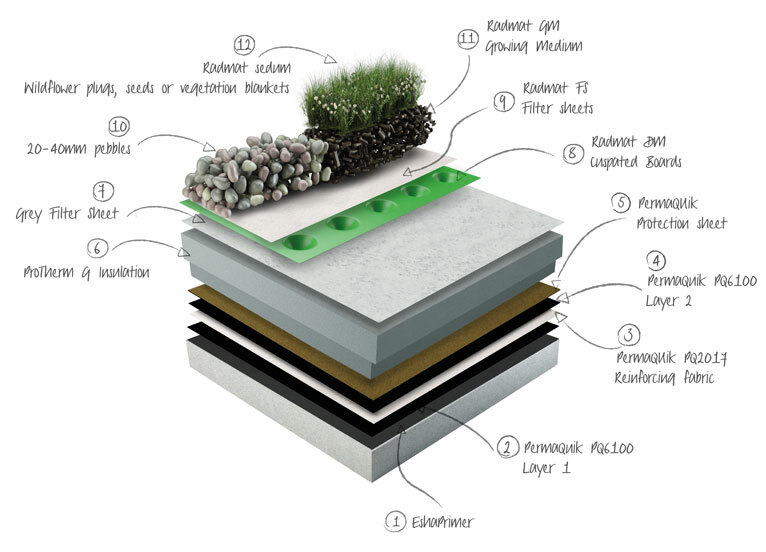 Intensive green roof systems involve using greater substrates depths (usually above 200mm) and often create a larger weight loading on the roof. Planting Options – MedO sedum systems are achieved using either SedumPlus pre-grown blanket, Sedum Plugs or hydroseeding. Read more about MedO planting here. 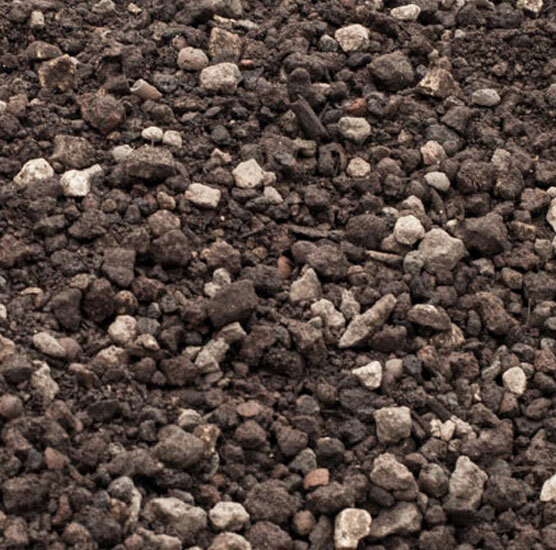 Radmat’s volcanic rock based substrates provides an effective growing medium for a range of plant types. Read more about MedO substrates here. Filter sheets prevent the substrates fines clogging the drainage board. Read more about MedO filter sheets here. A range of drainage boards to suit a variety of plant, drainage, water storage and attenuation requirements. Read more about MedO drainage boards here.